Lawrence Intermediate School music teacher Sharin Rello has been named the Mercer County Teacher of the Year by the New Jersey Department of Education. Rello has taught in Lawrence Township Public Schools for 13 years. 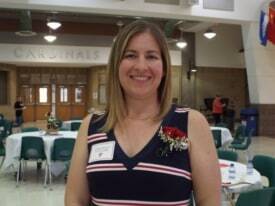 She is the tenth Lawrence educator to be named Mercer County Teacher of the Year within the past 24 years. County winners are first selected at the school level through the Governor’s Educator of the Year program. They then compete for county recognition and are selected by panels representing a cross-section of administrators, teachers, parents, and county education association representatives. “Sharin exemplifies not only the qualities of an extremely talented educator, but also the daily commitment, dedication and inspiration it takes to help a child achieve and exceed his or her potential,” Lawrence Superintendent of Schools Crystal Edwards said. The teacher of the year from each county will be invited to serve on state committees and task forces to share knowledge and improve public education in the state.